A mouse typically has one button on the left and one on the right. To select an item on the screen, you must move the mouse to point at that item and then press and release (click) the left mouse button. If you know how to point and click, double-click, and point and drag the mouse, you’ve mastered the basics of controlling your Mac with a mouse. Clicking (also called single-clicking): Move the mouse and press the left mouse button. Clicking is the most common activity with a mouse. Double-clicking: If you point at something and click the left mouse button twice in rapid succession (that is, you double-click it), you can often select an item and open it at the same time. Dragging: When you drag, you use your mouse to point at an item on the screen, hold down the left mouse button, move the mouse, and then release the left mouse button. Dragging is often used to move items on the screen. Many mice have a rubber wheel or ball embedded in the middle. By rolling this wheel or ball, you can make items (such as text or a picture) scroll up/down or right/left across the screen. Using the scroll wheel or ball can make your Mac just a little bit easier to use. Like the scroll wheel or ball, the right mouse button is optional but convenient. Pointing the mouse and pressing the right mouse button is known as right-clicking. Right-clicking is commonly used to display a pop-up menu (often called a contextual or shortcut menu) of commands to do something with the item that the mouse is currently pointing at. For example, if you point at a misspelled word, right-clicking that misspelled word can display a list of properly spelled words to choose from. Some older mice (as well as some older laptop Mac computers) do not have a right mouse button. 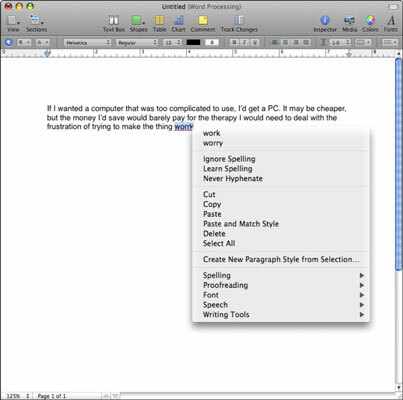 To simulate a right-click, hold down the Control key and click the lone mouse button (or hold down the Control key and click the single trackpad button on laptop Mac computers). If you don’t like your mouse, you can always buy a replacement mouse. Some mice are molded to better fit the shape of your hand, so find a mouse that you like and plug it into the USB port of your Mac, or get a wireless mouse that connects to your Mac through the Bluetooth wireless standard.